Thailand Travel Essentials Guide. What do you need before you go? Do you need a visa? What is the Currency of Thailand? Should I buy travel insurance? What should I take with me on a trip to Thailand? Health & Safety, What don’t I need to bring with me on a trip to Thailand? What is the best time of year to visit Thailand? Where should I stay in Bangkok? How much is a flight to Bangkok? Make sure your passport is valid for at least six months after your arrival date. Also, make sure that it is not damaged or defaced in any way. If so, you can be denied entrance. If you’re visiting Bangkok as a tourist you have the following options depending on your nationality. A visa exempt entry, a visa on arrival, a single or multiple entry tourist visas. Free visa exempt entry is available to citizens of 57 countries. Citizens of Canada, France, Germany, Italy, Japan, the United Kingdom, and the United States get 30 days arriving by air or land. This can be extended in-country for a further 30 days at an immigration office at a cost of 1900THB. Citizens of Australia, Austria, Belgium, Bahrain, Brunei, Czech Republic, Denmark, Estonia, Finland, Greece, Hong Kong , Hungary, Iceland, Indonesia, Ireland, Israel, Kuwait, Liechtenstein, Luxembourg, Laos, Macao, Malaysia, Monaco, Mongolia, Netherlands, New Zealand, Norway, Oman, Philippines, Poland, Portugal, Qatar, Russia, Singapore , Slovakia, Slovenia, Spain, South Africa, Sweden, Switzerland, Turkey, United Arab Emirates and Vietnam get 30 days arriving by air and 15 days arriving by land. You can apply for an extension of 30 days (air) or 7 days (land) at an immigration office at a cost of 1900THB. Citizens of Argentina, Brazil, Chile, Peru, and South Korea get 90 days arriving by air or land. This can be extended in-country for a further 30 days at an immigration office at a cost of 1900THB. Citizens of Cambodia get 14 days arriving by air or land and citizens of Myanmar get 14 days but only if arriving by air. A visa on arrival is available to citizens of the following 19 countries. Andorra, Bhutan, Bulgaria, China, Cyprus, Ethiopia, Fiji, India, Kazakhstan, Latvia, Lithuania, Maldives, Malta, Mauritius, Papua New Guinea, Romania, San Marino, Saudi Arabia, Taiwan, Ukraine, and Uzbekistan. It is valid for 15 days and costs 2000 THB. It is available on arrival at any International airport and at most land border crossings. You will need your passport, a photo, a completed application form, a completed arrival card, proof of onward travel, proof of funds of at least 10,000THB, proof of a hotel booking. A single-entry tourist visa is valid for a 60-day stay from the date of arrival. It can be extended in-country for a further 30 days at an immigration office at a cost of 1900 THB. You must enter Thailand within 90 days from the date of issue. You can apply at any Thai embassy or consulate worldwide. The cost of the visa is 1000 THB or the equal in the local currency of the country where you apply. Processing usually takes one to two days if applying in person, longer if applying by post. Thailand no longer issues double or triple entry tourist visas, as in the past. There is now a Multiple Entry Tourist Visa. It’s valid for 6 months from the date of issue and allows you to stay at most 60 days at a time in Thailand. Each 60-day stay is extendable for a further 30 days at an immigration office. You will then need to exit and enter again, though you can do this as many times as you wish within the validity of the visa. This visa can be stretched to 9 months through exiting and entering again just before the 6-month validity expires. The cost of this visa is 5000 THB payable in your local currency and you need to show proof of employment, proof of residence in your home country and proof of funds in your bank totaling at least 200,000 THB. Proof of a flight booking and first hotel booking may also be requested. This visa can only be applied for at Thai consulates and embassies in your home country or country of legal residence. 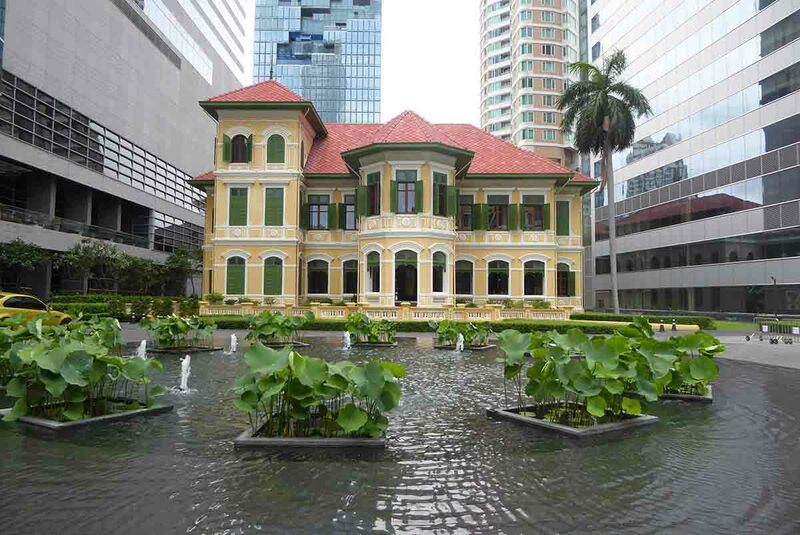 Find out how and where to extend your Thai visa in Bangkok here. Bangkok Buddy goes to Poipet and Thai Visa to Ban Laem both on the Cambodian border. Not all nationalities qualify for a visa run. Check the websites for who qualifies and who doesn’t, schedules and cost. Overstaying your visa can have serious consequences. The fine for overstaying your visa is 500 THB per day capped at most, 20,000 THB. The fine starts after the 2nd day of overstay. This is only payable at an International airport or land border on leaving the country. You cannot pay at an immigration office. If you’re arrested you will face prosecution, be detained in prison and then deported. Anyone who overstays over 3 months will face a long-term ban from entering Thailand. Overstaying from 3 months to 1 year will incur a ban of one year, overstaying from 1 to 3 years will incur a ban of 3 years, Overstaying from 3 to 5 years will incur a ban of 5 years and overstaying 5 years or more will incur a ban of 10 years. If you are planning to hire cars or motorbikes make sure you are fully insured for that vehicle as you will be responsible for any damage to it and any others involved in the case of an accident if not insured. Check policies carefully for coverage details. Don’t try to make false claims on your Insurance by claiming false theft. Thai police are wise to this and they will fully investigate your claims. Penalties are harsh if you get caught cheating. Tourist Bangkok is partners with World Nomads who is one of the best travel insurers for travelers. Get a quote. 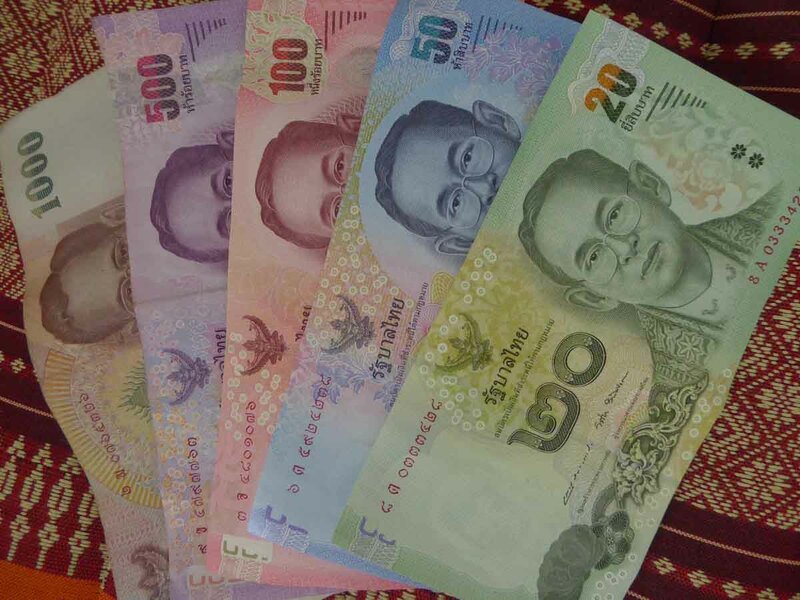 Thai currency is the baht & it comes as five denominations in notes. 1000, 500, 100, 50, 20 & in coins as 10, 5, 2 & 1. DO NOT buy Thai baht in your home country before departure. Wait until you get to Thailand. Exchange rates are 15 – 20% higher and there are no commission fees. Only bring notes that are in good condition. Banks and exchanges will refuse any damaged notes, in poor condition or have any writing on. Where to get the best exchange rate (15% more) on arrival at Suvarnabhumi airport or in the city check here. When departing, Thailand you should exchange any remaining Thai money back into your home currency at the airport because you will get a better exchange rate. Traveler’s cheques can only be exchanged at banks and foreign exchange booths which usually close by 10 pm. There is a 150-baht fee per cheque, though the exchange rate is slightly higher than for cash. Think of this as losing 15% of your money which makes traveler’s cheques a bad option though a safer one than cash. Only American Express cheques are valid in Thailand. You will need your passport when exchanging. Bring cheques in your home countries currency if available. Many banks outside the USA will tell you that you need $US for Thailand. This is rubbish. If you’re from the UK, you will be losing money by converting GBP to USD and then to Thai Baht. These are very popular and a safe way to carry your money but generally are poor value. You must pay for the card issue, then pay a fee to add more credit, poor exchange rates and often problems with acceptance. Bring in your home currency as the exchange rate for loading in Thai Baht (if available) will be poor. Money grabbing Thai banks will charge you 200 baht to make an ATM withdrawal. Check online comparison sites for the best deals. Make sure it will work in Thailand! Using your bank ATM/Debit/Credit card is the most convenient way to carry money for your trip. Bangkok has thousands of ATM machines which should accept foreign debit/credit cards issued by International banking networks such as Plus and Cirrus. Thai banks love foreign tourists and view them as walking ATM’s where they can make a withdrawal from your account every time that you do in the form of a 220-baht fee. There is no way around this as they stick together on this issue. The only exception is Citibank who doesn’t charge a fee to holders of Citibank debit/credit cards, though this may not apply to all countries. Unfortunately, Citi only has a few ATM locations. Withdrawal amounts are the same as your home country daily or weekly limit. If you are coming to Thailand contact your card issuer to check if your card is valid. Some banks need you to register your card pre-travel for overseas use and often for specific countries. Ask them if they refund the Thai bank withdrawal fee. Lastly, don’t exchange cash or traveler’s cheques in your hotel. You will get a bad rate! Important vaccinations like Tetanus, Hepatitis A + B should always be up to date wherever you are traveling or not. Malaria tablets are not required for a trip to Bangkok or anywhere else in Thailand. Make sure you bring mosquito repellent with you or buy some after you arrive. You should apply it to exposed legs and arms if you are outside after dark. Mosquito bites are not dangerous but are irritating. Local brands of mosquito repellent work very well despite what you might read elsewhere. Any medications that you are taking – If you forget or lose something don’t worry as most prescription drugs in western countries are available in Bangkok over the counter without a prescription. Even Antibiotics, Antihistamines and Insulin. For where to buy look here. And no, they are not fake. English language magazines – They are Imported and more expensive in Thailand. Extra-large size clothes – Thai shops don’t cater to large western sizes. Condoms – Sizes in Thailand are smaller. Tampons – Your usual brand could be unavailable in Thailand. Eco-friendly toiletries – Difficult to find. Smart casual shoes – You cannot enter some nightclubs and bars if you show up in flip-flops/sandals. Thai shoes are often a poor fit for westerners. A waterproof poncho – You only really need this if visiting between June and November. You can buy them in Bangkok but the one size fits all is too small for some people. A pen to fill in your landing card on the flight. Some small padlocks are useful, though you can buy them cheaply in Bangkok. A small handheld digital luggage scale to weigh your luggage before checking in for your flight. Bangkok airports have now privatized luggage scales near the check-in counters so that now you must pay to weigh your luggage. Weighing at the check-in counter is still free. You can buy most things that you may need quite easily in Bangkok and at cheaper prices than in your home country or at your departure airport. Here are some examples …. Toiletries – Boots the chemist and Tesco will be familiar to visitors from the UK and have extensive store locations in the Bangkok area. They stock most of the same brands and products you buy in your own country. Shower gel, shampoo, moisturizer, sunscreen, toothpaste, mosquito repellent, cosmetics, razors etc. are all a lot cheaper in Thailand, so no need to bring it with you. Branches of 7-11 are on every street corner and stock small size toiletries which are useful when you are traveling and want to keep your luggage light. Clothes – Don’t bring too much because you can buy all the following cheaply …. hats, t-shirts, shorts, swimwear, sunglasses, sandals, flip-flops etc. The popular Japanese store Uniqlo has many stores in Bangkok where prices are lower than in Europe or Australia. Their climalite range is good for the Thai climate. Photographic – Selfie sticks are for sale everywhere as are disposable cameras. SD cards are cheaper. Cameras are no cheaper than in your home country. Also, guarantees could be invalid in your home country. Phone accessories – USB adapters for local plugs are easy to find as are power banks. Sim Card – You can buy a special tourist Sim card at the airport on arrival or in the city. Batteries – Duracell and Energizer much cheaper here. Luggage – daypacks, rucksack, suitcases, are cheap if you buy no brand or copies though the quality is not as good because of poor quality stitching. All big brands are available in department stores but are not cheap. It’s better to buy a good quality rucksack or suitcase in your home country. Maps and guidebooks – Free maps and information booklets are available at official tourist information booths. Transport systems such as the BTS/MRT have free network maps available at stations. You can buy Bus maps and more extensive city maps at bookstores. All popular travel guides such as Lonely Planet/Rough Guides are available in local bookstores but are no cheaper than in your home country. Also buying one before you travel gives you something to read on the plane! Antiseptic cream and paracetamol – Essential for cuts and headaches. Can be bought very cheaply at Boots. Passport – valid for at least 6 months from your date of arrival. Photocopy of your passport ID page. If you travel to Thailand, November to February is the coolest time of year though it’s also the busiest time and most expensive in terms of flights and accommodation. April to June is hot, dry and humid making it the least comfortable time to visit. July to October is the rainy season though that doesn’t mean it rains all the time. Usually once a day at similar times, for a short period, but when it rains it pours! If you are going to take a holiday in Thailand, Bangkok has a tremendous range of accommodation catering to all budgets from modern hostels to budget, mid-range, and luxury top-end hotels. Dormitory accommodation in hostels starts from as little as 90 baht a night, budget hotels from around 600 baht, mid-range from 1500-4000 baht and top-end from 5000 baht upwards. Accommodation can be booked easily online often with pay-later and free cancellation deals. Hotels in Thailand work on a per room basis usually with a limit of 2 people to a double room. Online hotel booking websites give you a choice of rooms/beds when booking. If booking package deals via western agents watch out for the old per person or single supplement charges which can mean you end up paying a lot more than if booking independently through an online hotel booking website. One Important thing to consider if you travel to Bangkok is the hotel’s location. Is it near public transport, bars, restaurants, shops, and attractions? Always check your hotel’s location on the map as there is nothing worse than being stranded in an out-of-the-way location where you need to get a taxi to go anywhere. Bangkok has several tourist areas and you should consider carefully which area you want to stay in. Check our overview of Bangkok Neighbourhoods for more information on which area will suit you best.